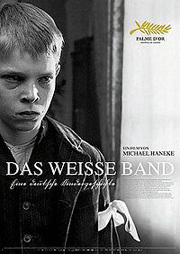 Molann Pat Butler saothar deiridh Michael Haneke, ‘Das Weisse Band’, go hard na spéire. Ní foirfeacht stiúrtha le fada an lá go dtí é.
Tá seanrá ag na Sínigh - ‘Go mairir an céad d’fhonn díoltas a imirt ar do pháistí’, ach i ndomhan an auteur Ostaraigh áirithe seo, ’s iad na páistí a imríonn díoltas gan taise ar thuistí is ar shochaí atá seasc, brúidiúil, ina bhfuil an ghangaid in áit an ghrá. Sochaí a chuireann fá chois iad. Sochaí ina gcoimeádann an Críost Liútarach agus an Kaiser Gearmánach fá riar, fá eagar agus fá smacht phiúratánach iad. 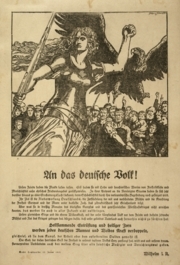 Sochaí, i mbliain ár dTiarna 1913, ar leic an Chogaidh Mhóir, ina n-oibríonn an Críost agus an Kaiser as lámha dianrialúcháin a chéile. Deir Haneke in agallamh le ‘Sight and Sound’ gur suim leis an ceangal idir phiúratánachas Liútarach thuaisceart na Gearmáine agus ‘cosaint’ na Naitsithe sin a mhaígh dá gcosaint féin nach raibh ach ord agus eagar á chur i bhfeidhm acu trí orduithe dleathacha a leanúint. Is fuirist lorg na cosanta sin a cheangal leis an gcineál sochaí a chruthaíonn Haneke sa ‘Ribín Bán’ dúinn. Rialaíonn ionadaithe an Chríost is an Kaiser pobal beag protastúnach na dúichí dúnta seo trí ordlathas docht. An Barún, an Tréadaí Ministéara, an Dochtúir, an tOide Scoile. Siadsan na húdaráis a láimhseálann cumhacht. Fána smacht siúd tá an stíobhard, na seirbhísigh, na hoibrithe, na sclábhaithe feirme. Agus na páistí. Sea a chairde, ná dearmadfaimis na páistí. Klara agus Martin, iníon agus mac an Mhinistéara ach go háirithe. Déagóirí atá éirithe dúr, stalcánta, doicheallach. Táid déanach don dinnéar. Tugtar an bata dóibh. Ceanglaíonn an t-athair, seirbhíseach Dé, ribíní báná lena ngéaga. Meabhrú na soineantachta, ach náiriú poiblí san am céanna. Ach ní drochfhear, ná drochathair d’aon ghnó an Tréadaí seo. An lámh in uachtar atá uaidh ar pheacacht nádúrtha an duine, sin an méid. Más í fearg fhíréanta Dé atá á thiomáint, cé atá ‘ciontach’ - é féin, nó an Dia míthrócaireach a adhraíonn sé? Arís, ní Haneke a ardaíonn na ceisteanna seo. Éalaíonn siad aníos as fo-chomhfhios an bhreathnóra. An réamh-mhacalla iad na ribíní bána seo de na comharthaí réaltógacha buí lena mbrandálfaí díchumhachtacha eile sa tsochaí céanna scór bliana ar aghaidh? Agus, más ea, arbh iad Klara agus Martin a smaoinigh ar a leithéid de chleas úiríslithe? Meabhrú na ‘ciontachta’, agus náiriú poiblí san am gcéanna? Arís, fágann Haneke an dúcheist ar oscailt dúinn. Sin é a bhealach oibre. Níl stiúrthóir scannáin ann níos daonlathaí ná é. Tugann sé an t-amhábhar dúinn. Ach is sinne, an lucht féachana, na heagarthóirí a iomlánaíonn an scéal, óna shamhlaoidí siúd, dúinn féin. Is bealach nua déanta scannán é seo. Is maith a thuigeann Haneke cad tá ar siúl aige. Arbh í iníon an Dochtúra a leag an bobghaiste dó, mar díoltas as a mí-úsáid fána láimh? Tá an Dochtúir i gcaidreamh fuarghnéis leis an mbean chabhrach bhocht, a tháinig chun cónaithe leis tar éis bhás a mhná i luí seoil. An rabhadar beirt comhpháirteach ina bás siúd? An féidir dul i muinín tráchtaireacht an Mhúinteora? Ceisteanna anuas ar a chéile. Cuirim mo mhuinín in ealaíontóir a ardaíonn i bhfad níos mó ceisteanna ionam ná freagraí. Cothaíonn Haneke an éiginnteacht chruthaitheach oscailte, a thugann ar turas sinn isteach i saol na ndaoine fírinneacha inchreidmheacha seo ar an scáileán romhainn. Mairimid ár ndaonnacht féin tríothu. Níl aon chur i géill ná aon chleasaíocht ar siúl aige linn. Níl ár gcuid mothúchán á láimhseáil ná ár dtreorú le ceol aige ach oiread. Locht, admhaím, go gcaithfead leigheas ionam féin. Níl stiúrthóir scannáin ar domhan is fearr a thugann meas agus urraim don mbreathnóir sa tsaoirse is a bhronnann sé orainn. Tá seanchloiste againn gur ‘bréag’ atá á hinsint agat dá luaithe a chuirfidh tú dhá sheat le chéile. Gur ionramháil, ar a fheabhas, atá ar siúl agat. Nach í an réaltacht a thuilleadh atá agat, ach eagrán amháin de. Tá fírinne sa léamh sin fós, ach creidim, le cur chuige ionraic, oscailte, réabhlóideach Haneke, gur thug sé mé i bhfianaise a chuid carachtar, agus an domhain ina maireann siad. Creidim gur mhair siad ionam agus tríom le linn na teaspána, is go bhfuilid á n-iompar istigh anois ionam ó shin. Ní gach lá den tseachtain a tharlaíonn sin dom. Tá na féidireachtaí scannáin curtha in athriocht ag Haneke. Seasfaidh an ceann seo. In ainm Dé, nó ar ór nó ar airgid, ná caill é.